Looks can be deceiving! Can you tell in this video which are the larger diamonds? 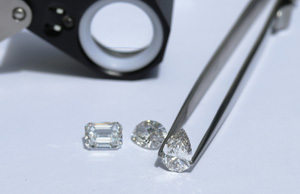 The loose diamonds may look smaller, but are actually larger at 0.85ct each (compared to the set diamonds at 0.77ct and 0.82ct). Although the diamonds that are set look bigger in the video, they're actually smaller in size. We know that a good setting can elevate an average quality diamond, while a poor setting can make even an internally flawless diamond lose it's luster. It’s important to know that when purchasing bespoke jewelry with Ada, your Diamond Concierge will always show you images and video where possible of the loose diamonds for consideration. Without the “framing” of a beautiful setting, designed to enhance our excellent cuts, the loose diamonds can appear smaller than they will once set in jewelry and worn by the recipient. You can also refer to the image below for a comparison of diamond carat sizes on a ring. Ada Diamonds are the strongest, brightest, and clearest diamonds on the market-and the best when graded by the 4 C’s. Our team works tirelessly to ensure we’re providing the best diamonds available for each customer’s perfect piece of diamond jewelry. Ready to build your own piece of bespoke diamond jewelry? Browse over 100 collection pieces, or create from your imagination. Get started with an Ada Concierge today.